.WARNING: If you haven’t read Shatter Me, this review could very easily be spoilery. So, proceed with caution. After reading Shatter Me this spring, I was reeling. It blew me away with its poetic language and incredible characters. I couldn’t wait for Unravel Me. When I found out Tahereh Mafi was publishing a novella from Warner’s perspective I was thrilled. To be honest, I liked Warner in Shatter Me. Granted, he was the villain and a bit of a pyscho at times, but I just couldn’t shake the feeling that there was more to him. He’s what I like to call a sympathetic villain. Now, that being said, I still wanted Juliette to end up with Adam. I was simply intrigued by the idea of understanding Warner better. In some ways, I am very conflicted by this novella. I loved getting to know Warner. I loved getting to see glimpses of Juliette’s journal and get a deeper understanding of her character even though she’s not really in the novella. It was very interesting to me to see his interpretations of events that Juliette and Adam saw extremely differently. It was also interesting to see the Reestablishment from the prospective of someone in power. I love the politics of this society. But most of all I love Warner. He is so broken, such a little boy in a man’s body. His life has been terrible and can relate to Juliette in that way very easily. However, he’s chosen a very different road than Juliette, despite their similar circumstances. Also very interesting is the appearance of Warner’s dad. He is the devil and can rot. I am so disgusted by him…sigh…I don’t have words for that man. The writing is every bit as gorgeous as Shatter Me, but it’s very different since it’s from Warner’s perspective rather than Juliette’s. While Juliette’s mind is spinning out of control, on the brink of despair and insanity, Warner is tightly controlled and managed. He examines every detail and searches every thought. He is wound tight and is rarely startled or surprised by anything. Therefore his feelings for Juliette has left him shattered and destroyed, dare I say unraveling…yes, this is intentional. The amazing thing about Tahereh’s writing is how she makes you feel everything the character is feeling. She throws you into the character’s mind and you go every step of the way with them. It is incredible. I felt Warner’s heartbreak, his obsession, his hurt, his past. Every bit of this story clung to me as I read. Oh I’m totally still Team Adam. I just sympathize with Warner. Like I said, I don’t want him unhappy. I just don’t know what Tahereh’s going to do with this boy. I love love love Warner! Thanks for the great review! Yay! You’re welcome! Thank you for commenting! Thanks for the review! I listened to Shatter Me recently on audiobook and loved it! I can’t wait to get my hands on anything else by Tahera Mafi. Warner is definitely intriguing so this book should be interesting. I absolutely love Adam though and will miss him here. I just KNOW that I’m going to love Warner…but I love Adam…..GAH!!!! I need this one so bad, like yesterday. Thanks for the review,awesome!Can’t wait to read it! Definitely explains some things for sure! I loved reading Warner’s perspective. How could I not love this broken boy?! And combining this with Unravel Me is beyond intense. I agree w/ you, I love Tahereh’s writing. Thanks for the great review! 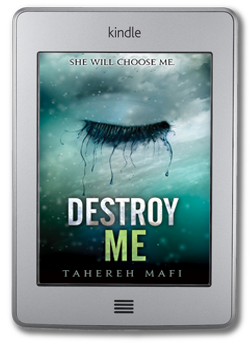 Even though I didn’t love Shatter Me as much as many seemed to I still really really want to read Destroy Me. Now that I see it’s from Warner’s POV I am even more curious. Can’t wait to get into that guy’s head! It’s super awesome for that reason! Hope you love it! Enjoy it! It’s short so you’ll be able to read it super quick! I read Shatter Me and LOVED it. I can’t wait to read this one. I’m super excited for the next book, too!!! Unravel Me is so good…super intense. I also loved the poetic language and her unique style of writing. I cannot wait to continue this series and am glad to hear that Destroy Me is good as well. Thanks for your thoughts! Yay! Lemme know what you think as you continue on!